In our youth obsessed culture, we’re bombarded by media images and messages about the despairs and declines of our later years. Beauty and pharmaceutical companies work overtime to convince people to purchase products that will retain their youthful appearance and vitality. Wrinkles are embarrassing. Gray hair should be colored and bald heads covered with implants. Older minds and bodies are too frail to keep up with the pace of the modern working world and olders should just step aside for the new generation. Ashton Applewhite once held these beliefs too until she realized where this prejudice comes from and the damage it does. Lively, funny, and deeply researched, This Chair Rocks traces her journey from apprehensive boomer to pro-aging radical, and in the process debunks myth after myth about late life. Explaining the roots of ageism in history and how it divides and debases, Applewhite examines how ageist stereotypes cripple the way our brains and bodies function, looks at ageism in the workplace and the bedroom, exposes the cost of the all-American myth of independence, critiques the portrayal of elders as burdens to society, describes what an all-age-friendly world would look like, and offers a rousing call to action. It’s time to create a world of age equality by making discrimination on the basis of age as unacceptable as any other kind of bias. Whether you’re older or hoping to get there, this book will shake you by the shoulders, cheer you up, make you mad, and change the way you see the rest of your life. Age pride! 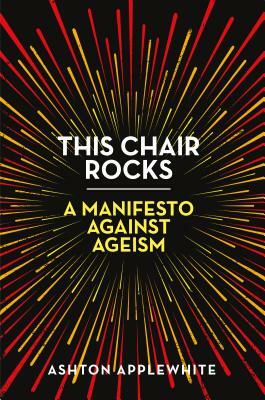 "[This Chair Rocks] provides a positive view of aging that is sorely missing in today’s popular culture. Appealing to a wide audience, it might even serve as a spark for positive social change." “An upbeat, empathetic, and practical guide to becoming "an old person in training." "This Chair Rocks is radical, exuberant, and full of all sorts of facts that erase many of the myths and beliefs about late life. As Applewhite defines and describes ageism, new ways of seeing and being in the world emerge, empowering everyone to see things as they really are." "Sometimes a writer does us all a great favor and switches on a light. Snap! The darkness vanishes, and in its place we find an electric vision of new ways of living...This Chair Rocks illuminates the path." "A smart and stirring call to add ageism to the list of 'isms' that divide us, and to mobilize against it. An important wake-up call for any baby boomer who's apprehensive about growing old."